Fisherman bait Israeli naval forces along 6-km nautical border, officers say - and may be looking to reel in intelligence, not food. Following the end of Operation Protective Edge in Gaza in August, Israel has allowed Palestinian fishermen to venture six nautical miles (about 9.5 km) from shore. But as fisherman continue to complain over restraints on their movement - designed to prevent terrorism and to separate Hamas from its weapons suppliers - and IDF officials have raised concerns that they may be systematically creeping toward Israeli shore, it was revealed Sunday. Egyptian sources told Israel early in ceasefire negotiations that Hamas would demand a radius of 12 nautical miles (22 km) for Gazan fisherman, but official declarations to that effect were never taken. But Naval Corps officers told Walla! News Sunday that frustrated fishermen have begun casting their lines beyond that boundary on their own - "systemically deviating" from the agreement while also making obscene gestures at soldiers and ignoring calls to remain within the naval limit. As a result, tensions along the Gaza coastline have been eddying, they said. Navy Commander Colonel Ram Rothberg increased patrols along the six-mile border to prevent further infiltration into Israeli waters, but public defiance of this has only increased. Over the past two weeks, an Israeli ship apprehended one vessel and took it into Israeli custody; at least three Palestinian fishermen have been arrests; and in one case, a fishing boat was forced to be apprehended long-distance, by naval personnel disabling the boat. 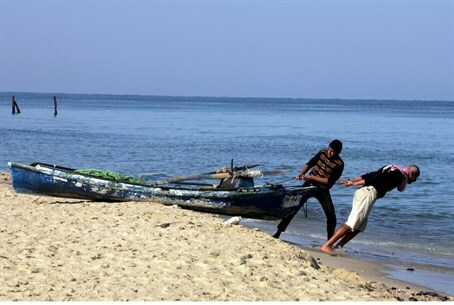 "There is no doubt, the fishermen in Gaza have become bolder and more brazen," a Navy officer told the daily. "On the one hand we know that they want to throw nets and fish in areas where there are more fish, but on the other hand they ignore ostentatiously international guidelines." "I do not want to say that this is the Palestinian Marine Intifada," he added, "but in some cases they act as if they have nothing to lose." "This raises suspicion that they are not just there to catch fish, but also to gather intelligence about the Navy, so that one day they can carry out a terror attack." The officer affirmed that, despite this, border patrols along the nautical line have been frequent, and have kept terror at bay - for now. Meanwhile, the defense establishment has expressed growing concern over attempts to smuggle weapons by sea, in attempts to replenish the arsenal the IDF destroyed during the Gaza war. To combat this, the Navy has been working closely with the Egyptian Navy, sources said, as Egypt is also in the midst of its own crackdown on Islamist terrorism.